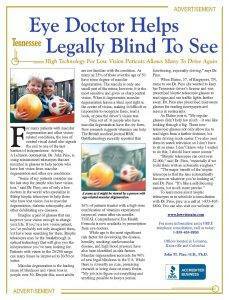 With an office in Lebanon, Low Vision Of Tennessee serves Tennessee, Kentucky, and Georgia. Call us to make an appointment with Dr. Pino to talk about your eyeglasses, contact lenses or specialty lens needs. You are also welcome to drop in anytime to browse through our large selection of designer eyeglass frames and sunglasses.